Welcome to a new storyline. This one will run 27 parts. 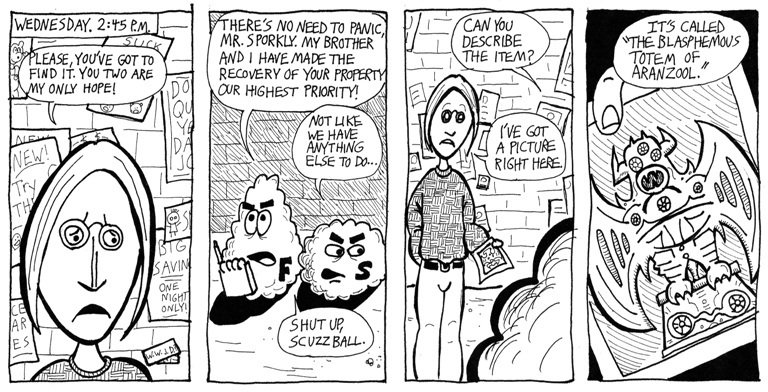 I've mentioned on here that Fuzzball & Scuzzball are detectives, but this is the first time in the webcomic that they get an actual case. I'm pretty sure that this story was inspired by The Maltese Falcon. That statue F&S are being hired to find looks kind of like a bird, right? Anyway, after the short "Hi-Jinx" story, I wanted to do something more challenging. If you look at most of the comics I've drawn, you'll see that there's some sort of built-in excuse for the art not being very good. Like, "I drew this whole comic in 24 hours" or "I drew this without penciling". "Hi-Jinx" was just Fuzzball sitting in a void talking to a caption, so it was not very artistically demanding. In this story, though, I really tried to make it look good. I took my time and used nice pens and good paper. This story looks as good as I could make it look when I drew it, ten years ago. If the art looks bad, it is an honest and heartfelt failure. I also put extra effort into plotting it. In addition to the normal dumb jokes, there are twists and turns and reveals. Like in the Maltese Falcon. So follow along, over the next nine weeks, and see how it all unfolds.